Teeth whitening is a simple, non-invasive treatment used to change the color of natural tooth enamel and is an ideal way to enhance the beauty of your smile. In our office we are using Dash In-Office Whitening Treatment. We can offer Dash for a lower cost than Zoom, it also is completed in about half of the chair time, and the feedback we have received has been great. Patients have had virtually no sensitivity during or after the procedure, and have been very happy with prominent results each time. Because having whiter teeth has now become the number one aesthetic concern of most patients, there are a number of ways to whiten teeth. At our office we offer various types of whitening from custom take-home trays or professional in-office treatment, to a year long program where we will use all available methods over the course of a year for the most optimal results. 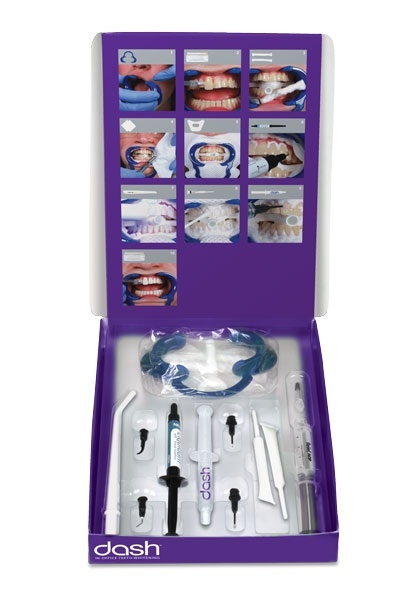 The most popular method is using a home teeth whitening system that will whiten teeth dramatically. Since teeth whitening only works on natural tooth enamel, it is important to evaluate replacement of any old fillings, crowns, etc. Replacement of any restorations will be done after bleaching so they will match the newly bleached teeth. What does take home teeth whitening involve? At your second appointment, you will try on the trays for proper fit, and adjustments will be made if necessary. The trays are worn with special whitening solution either twice a day for 30 minutes (Philips DayWhite) or overnight (Philips NightWhite) for a couple of weeks depending on the degree of staining and desired level of whitening.